Where Can You Buy Ethereum? Ethereum is the world’s second largest cryptocurrency by market cap. Today, the market cap of ETH is about half that of bitcoin. Want to invest in a cryptocurrency that isn’t bitcoin? Ethereum has plenty of its own unique benefits and features that could make it an attractive investment. Some people buy Ethereum just to participate in ICOs or buy ERC20 tokens. Buying Ethereum is very similar to buying bitcoin or any other major cryptocurrency: you can either purchase it from an exchange or a local reseller. You may be able to find an Ethereum ATM in your area. However, they’re nowhere near as popular or as common as bitcoin ATMs – so we didn’t mention Ethereum ATMs on this list. Buying Ethereum from an online exchange is your best and safest option. Today’s major exchanges let you transfer fiat money (like USD) into your online account, then purchase ETH directly. Many exchanges offer pairs like ETH/USD, allowing you to sell your USD in exchange for ETH. Different exchanges have different pairs. You can visit Canadian exchanges like CoinSquare and QuadrigaCX to access ETH/CAD pairs, for example. Other exchanges offer ETH/RUR, ETH/EUR, ETH/GBP, ETH/JPY, ETH/AUD, and other pairs. Not all exchanges let you buy Ethereum directly with fiat currency. In other cases, you may need to buy bitcoin with fiat currency, then sell bitcoin for Ethereum using a BTC/ETH pair. Always be sure to check the fees before you buy. Online services like Coinbase make the process of buying Ethereum very convenient – but they also charge an enormous fee of 5% for their service. 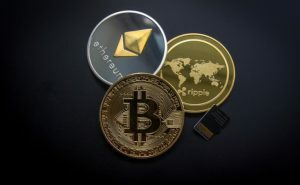 Typically, online exchanges will charge fees of 0.3% per trade or less, although you may have to pay a fee to deposit money into the platform. In our “Where to Buy Bitcoins” article, we mentioned a website called LocalBitcoins.com. That website is the original local crypto reseller marketplace – it’s like Craigslist for people who want to buy and sell bitcoin. Fortunately for Ethereum buyers, an Ethereum competitor called LocalEthereum has emerged online. Found online at LocalEthereum.com, the website lets you browse local offers to buy or sell Ethereum. It’s a peer to peer marketplace where you can swap Ether for cash, a bank transfer, and other payment methods. You might meet someone in person and give them cash, for example, before swapping Ethereum using your mobile device. If you want to buy Ethereum anonymously, then LocalEthereum is your best option. Exchanges will always make you verify your identity – especially if you’re trying to buy Ethereum with fiat currency (if you already have bitcoin, then you should be able to find exchanges with no verification process required). If you’re completing a transaction in person, then you’ll need an Ethereum wallet. Ethereum’s official wallet is called Mist. Other popular browser options include MyEtherWallet. Of course, you’ll want a mobile wallet – not a browser wallet – for most in-person transactions. You can find wallets like Trust and Ethereum Wallet by Freewallet available for free from the iOS or Android app stores. Buying Ethereum is similar to buying bitcoin: the only real difference is that there aren’t as many Ethereum ATMs or Ethereum pairs. Nevertheless, as the world’s second largest cryptocurrency by market cap, Ethereum is quickly climbing the ranks – and that means it’s easier than ever to find places where you can buy Ethereum.